The fabulous state of Indiana is rich in history and home to the “eighth wonder of the world”. A recent Spring Break family trip took us to the state of Indiana. Our family traveled to Indiana to purchase a puppy from a particular breeder. I had traveled through Indiana for business in the past, but never took the time to really discover all that the state has to offer. Being a family of four, we are always interested in staying at resorts with a variety of amenities and activities for the kids…and the adults. One of our favorite resorts offering a wide variety of activities on the east coast is the Greenbrier HERE. Little did we know…that Indiana has a very similar resort offering an abundance of activities for families as well. My husband and I refer to the French Lick Resort as the Greenbrier of Indiana. During our trip, we stayed at the West Baden Hotel. The French Lick Resort and the West Baden Springs Hotel are located within a mile of each other in the town of French Lick, Indiana. Weird name…right? French Lick got its name from the early French settlers and the “mineral licks.” French traders came to the area and discovered the mineral springs bubbling from the ground in the vicinity of what is now French Lick. In 1855 the Mile Lick Hotel was built to capitalize on the abundance of mineral springs in the area. The name was later changed to West Baden Springs Hotel as it was fashioned after the great mineral spa of Europe, Baden Baden. Lee W. Sinclair transformed West Baden into a sophisticated resort, adding an opera house, a casino, a two-deck pony and bicycle track and a full-size baseball field. Sadly, in June of 1901 a fire destroyed the entire lodging structure in less than two hours. Sinclair used this tragedy as his opportunity to build the hotel of his dreams. He envisioned a circular building topped with the world’s largest dome, decorated like the grandest spas of Europe. Architect Harrison Albright completed the project within a year. The new hotel, complete with a 200-foot diameter atrium opened for business in June of 1902. A century later, after changing ownership several times and going through a multi-million dollar renovation, the West Baden Hotel and the French Lick Resort have returned to the grandeur of the early 1900’s. This picture shows the lobby of the west Baden Hotel. Once called the “Eighth Wonder of the World,” the focal point of West Baden Springs Hotel is the awe-inspiring atrium that spans 200 feet. And has the ability to change colors. Each floor of the hotel has a quaint seating area in front of the elevators. The architecture and style of the dome is truly remarkable. A view into the lobby of the West Baden from the second floor. Too cold during our visit to swim outside, but having an outdoor swimming pool is a nice amenity during the warmer months. We did take advantage of the large indoor pool. The West Baden Springs hotel has earned the title of national historic landmark. 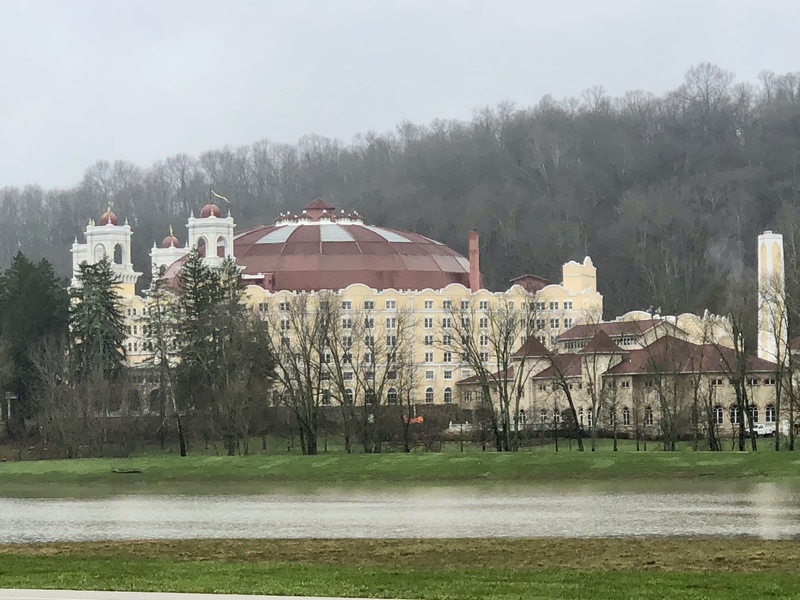 A short shuttle ride away is West Baden’s sister Hotel..the French Lick Resort. The lobby area is decorated in true french style. With crystal chandeliers, doric columns and a lot of gold accents. The hotel has earned a 4 diamond distinction from AAA. Fresh flowers are displayed near the lobby entrance. Curio stands line the hallways of the resort filled with hotel treasures. The resort also houses a 27,000 square foot spa. When choosing a vacation spot for our family, the choice of restaurants is important to us. We like to enjoy a variety of casual and fine dining. My husband and I enjoyed a fabulous meal at one of the finer restaurants in the hotel. We were seated in a private and quiet room of the restaurant with only 2 tables. The beverage menu had a nice selection of specialty cocktails and liqueurs. The main menu had a wide variety of appetizers and entrees from which to choose. I always love a good steak..
And fish option. The food was excellent at the restaurant and the atmosphere superb. All in all, I would definitely recommend the 1875 Steakhouse as a wonderful fine dining option in the French Lick area. The presentation of a single red rose at the end of our meal was icing on the cake. Outside the resort, but located within a few miles are numerous activities as well. We took our kids to an Indoor karting track. My heart skipped a couple beats as I watched my 9 year old zip around those curvy bends at full speed! But they had a great time doing it, definitely one of the highlights of their trip. After karting, we headed to the French Lick Winery to do a tasting of local wines. We also took a trip into Kentucky to tour the Buffalo Trace Distillery HERE. A fascinating tour of a 200 year old warehouse and operating distillery that even stayed open during prohibition. Besides great dining, swimming, hiking, shopping, fitness, bowling, and touring, you can enjoy biking, hiking, golf, horse riding, and carriage rides. So next time you think about Indiana for a family trip..think about the French Lick Resort HERE. For more great destination ideas, subscribe to the blog and follow along on Pintrest HERE, and Twitter HERE and feel free to pin and tweet your favorite pics from Happy Haute Home. Larry Bird is from French Lick, Indiana. It was a really neat place to visit Joe, if you and your family are ever in the area…you should check it out. Wow! What an amazing place! Love it! It really is..never knew about it before our visit. So glad we got the chance to experience it. You should check it out if you are ever in the area. Enjoyed your summary of the the French Lick Area. When in Indiana I will be sure to visit. Thanks Cher…so sweet of you to drop a comment. Yes the resort was a unique and very cool resort, we enjoyed our visit very much. Fancy, Fancy! I’m sure there’s a fancy price tag here too! 🙂 However, there’s nothing like a fabulous hotel. I love it. Wow! What a fabulous place. The West Baden is definitely an unusual hotel for sure, definitely worth visiting if you are ever in the area.